Cutting her Christmas vacation short, Agatha returns to Carsely, and is given an earful from her neighbors about Sunday's attempts to shut down the village's festivities. It isn't long after Agatha's return that Sunday is murdered, and Agatha's detective agency takes on the case. Nevertheless, this mystery won't be easy to solve, especially since Sunday was hated passionately by all of Carsely. M.C. Beaton never fails to please in the cozy mystery department. 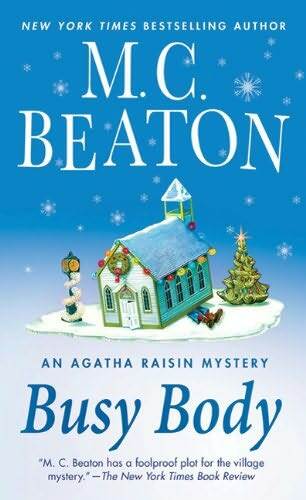 Readers familiar with Agatha Raisin and her past attempts to enjoy Christmas will smirk and giggle through the first chapter of Busy Body, which, of course, provides a rundown of Agatha's numerous vacation misfortunes. When Agatha returns to Carsely, she is reunited with characters who are series regulars; including the cheapskate and wannabe-lothario Sir Charles Fraith, the pale and weedy Roy Silver, and the ever-present beloved characters of Mrs. Bloxby and Toni Gilmour. Beaton also introduces a new character named Simon Black - an intelligent, young, and clowny-looking young man who is hired by Agatha's detective agency and may also be a future potential love interest for Toni. The mystery at the core of Busy Body is pure Beaton in all its glory - chock-full of red herrings, eccentric characters, and a cliffhanger ending about Agatha's love life that leaves us in the lurch for the series' next installment. Actually, Beaton was feeling extra generous in regards to Agatha's love-life in Busy Body, making her the apple of the eyes of several major recurring characters. It's about damned time! Preceding Busy Body in this series are There Goes the Bride and A Spoonful of Poison. Readers who are caught up with the series can follow up Busy Body with As the Pig Turns, and Hiss and Hers, which is scheduled to release in September 2012. Click on any of the images displayed below to review them in more detail on Amazon.com. What are your favorite mystery books by M.C. Beaton? Do you have a different favorite cozy mystery series? Share your thoughts and favorites with us in the comments section below! As the Pig Turns is HILARIOUS!!! You should read it next. Hi Sarah, Christmas in July, you are funny. I haven't read any of the books in this series but they look kinda sweet and funny. Thanks Anna Lynn and Anonymous! You bet I'm going to read As the Pig Turns. The Christmas in July read was actually accidental, haha. I couldn't wait until the holiday season to read this next Agatha Raisin book! They are just that good. I wrote a post that discusses the best cozy mystery series here: The 7 Best Cozy Mystery Series, in which I mention the Agatha Raisin series. M.C. Beaton is just the BEST!